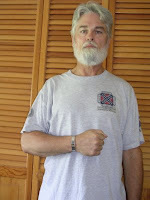 Attached is a photo of myself wearing my POW bracelet. I found your site as a result of speaking with a Marine, wounded in Iraq, who was wearing a bracelet himself. I ordered a new bracelet as a result of my original having recently developed a crack or split in it after 37 years of wearing it and which I will now forward to the family although I realize he has yet to be accounted for (just thought they might want it after I wore it that long). FYI, my original cost me a $3 "donation" in August, 1971, at the West Virginia State Fair.